I love the special time of Valentine's and Sweethearts, I am such a romantic. I am planning a very special dinner for my sweetheart this valentine day. 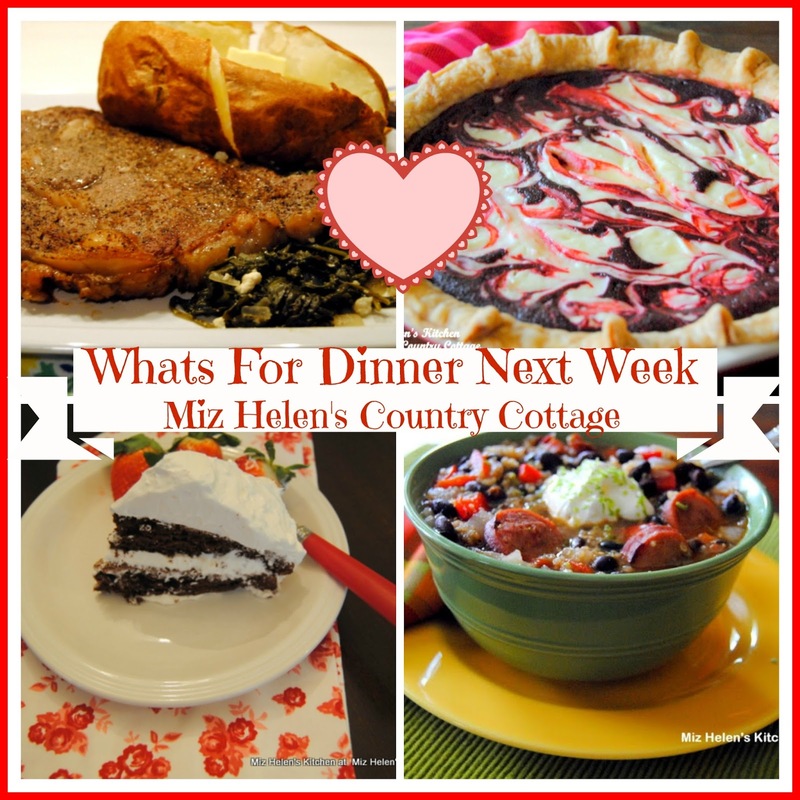 I also have some busy days coming up so I will sure take all that into consideration when making my meal plan for the week.Are you planning a special dinner for your sweetheart this week? Let me know what your plans are, it is always fun to see what others are planning. I am always so excited to share time with you in the kitchen and thank you so much for stopping by. Hope you have a very special week and come back to see us real soon! Happy Valentines Day to you and your special someone. I am going to make your family recipe of cherry pie for my husband. He loves anything with cherries and when I saw your pie a few weeks ago I knew that was what I would do for this Valentines. What a great week of meals, Miz Helen! I'm drooling over your sour cream chocolate cake right now. Ooh, that sour cream chocolate cake looks delicious! I'm making something cherry (haven't decided what yet) for Valentine's Day because that's my husband's favorite but maybe next week I need some cake. I always look forward to your what's for dinner - the red velvet pie looks amazing!!! Thanks for sharing on the What's for Dinner link up! Thanks for sharing on #OverTheMoon. Have a great week.